Archaeologists seek the fabled "lost cycle lane of Stokes Croft"
It's long been claimed that there is a pre-roman era cycle lane on Stokes Croft, hidden under the parked cars. Some viewers may be surprised by the fact that the university professor didn't know much about living on the Isles of Turbo, even though the university is 0.8 miles away. Remember, Bristol measures its status in vertical metres, the uni is near the top of the hill, whereas from Turbo Island the only place left to go down is the bear pit. Even so, Stokes Croft does not like to deny opportunities to anyone -all university faculty members are invited to the island, just bring your own drinks. Some ethanol from the chemistry department would go down a treat. A few of our cycling-troublemakers objected to the build-out at the junction with Observatory Road, on the basis this would increase car/bicycle conflict. This argument was dismissed with this simple reposte: there are no build outs on Suspension Bridge Road. This is fantastic, because it not only destroys all objections to the build out -it makes the cyclists question their own sanity. Do they see build-outs on Suspension Bridge Road and Gloucester Row? They aren't there. Those bits on the map where they say "proposed footway build outs with dropped kerbs"? They aren't there. This is as great a way of dealing with objections as the "the cycling group said it was OK". Here you don't need to even reference that, you just say "you are mistaken, there are no build outs on that road". Here then, as promised, is the council's response. The council cycling QA team reviewed it -and didn't object. Therefore there are no problems with the route. So their objections will be ignored. This is fantastic! It shows the way forward for building pro-car designs in an anti-car city. All we have to do is involve the cycling team at the last minute, get some inadequate review from them -and we've got a green light to do what we want. Once the cycling team at the council say there is nothing wrong with a route, all objections from cyclists can be discounted. It is considered that the proposed built out footways in the junction will reduce the speed of traffic turning into Observatory Road, making the junction easier to negotiate as a pedestrian. Furthermore the crossing width is also proposed to be reduced. It is understood, however, that the existing refuge island is useful in allowing pedestrians to cross one stream of traffic at a time. 17. The westmost table, can the carriageway be widened to widen the cycle lane, please? Consider left hand drive foreign coaches, when children will be alighting into the road rather than onto the footway – can a sign be erected to encourage foreign drivers to pull in wrong direction so that children can alight onto the footway? Thinks tourists miss the village, they only visit the bridge. Can some sort of signing be installed to direct them to the village? Can Parks be prevailed upon to improve the steps which are approx. 30m s/w of Observatory Road? Also the slope down to the eastmost proposed table is treacherous in winter – can this be relaid with a rougher tarmac? Railings on the northern side of the eastmost proposed table – please restore the railings which are bent and need painting. They should be moved rather than shortened! There was a sign reading, “To the public lavatories” which was removed some time ago, it was on a l/c, just east of the eastmost proposed table. It was taken to store, please can this be restored and repositioned? Scruffy around the WCs, whose responsibility is this? Why is the weighbridge so close to the bridge rather than near the Sion Hill junction? This comment is answered in point 42. Another objection we saw, an other naive fool expecting that their input would actually be read, let along act on it. For now, cherish the effort they put in with the expectation that someone would actually read it. (This is Stella Nova trail; Strava notes that this tax-dodger is only just in top 25% of riders, so they lack both skill and fitness. I am an occasional user of the Clifton Suspension Bridge, mostly by bicycle, mostly in an inbound direction. There appears to be significant cycle traffic across the bridge, and it is important that cycling aspects should be taken into account in any modifications. Cycle traffic is generated by the Ashton Court park, general access to the countryside, and possibly by local commuting. Additionally I am aware of long distance commuting from Pill. 1. It is not clear whether the works have been formally assessed with regard to cycling. This should be done. 2. Although the proposals correctly identify the area as one needing a treatment based on the considerable pedestrian traffic generated by the bridge, gorge and surroundings, and that pedestrian movement should be facilitated this has not been carried to the correct conclusion of adopting a much lower speed limit throughout the entire area from the Sion Hill junction to a similar point beyond the bridge on the other side. For road safety and structural reasons a limit of 10 or 15 mph would be appropriate. 3. (a) The narrowness of the road means that particular attention should be given to the safety of cyclists. Paradoxically the safest part of the road is probably the exit section where the carriageway divider means that it is obvious that overtaking is impossible and where it is almost impossible for a cyclist to ride in a position that suggests that overtaking is desirable. This fact should be considered with regard to the whole area, in particular the dangers of the existing narrow cycle lane on the Leigh Woods side should be reviewed, with particular regard to its tendency to suggest that cyclists can be overtaken in the bridge approach. (b) I agree with the retention of the central carriageway dividing strip, and suggest that this could be extended onto the bridge, with other measures to discourage overtaking, in particular the speed limit suggested above. (c) Appropriate signing to draw drivers attention to the need to take care of cyclists would be useful. 4. The proposed safety tables give rise to some concern. Safety tables tend to be too sharp for cyclists and suffer structural deterioration fairly quickly, creating a dangerous surface. I suggest that the existing safety table design, covering half the road and therefore being completely bypassed by cyclists is the best concept. 5. (a) The provision of a short term coach drop off point in Observatory Road could be done at minimal expense and disruption simply by painting a box on the road. The net loss of land on the Downs is bad in principle and in practice, since it pushes the greensward further back. The expense of the proposed works to construct a coach drop off is entirely unnecessary. (b) Since the buildouts are presumably intended to discourage traffic from entering Observatory Road it would be logical to close this road completely except to cycles and coaches, facilitating use of the road by cyclists and as a coach drop off point. Without this the buildouts themselves become an additional hazard for cyclists. There is no obvious reason why Observatory Road is needed as a route for through traffic. Closing it to most motor traffic would unify a green area extending a considerable further distance towards Christ Church. 6. The review of the Sion Hill junction should extend back over the whole length of Suspension Bridge Road, which is not an attractive road to cycle on. I have just had a chance to look at the consultation leaflet relating to the Proposed improvement works Suspension Bridge Road area (RS 12088). I am an office worker who ... cycles to work across town to ... Square every day (so, two journeys across the suspension bridge each day). I am not convinced that this will create a safer, more friendly environment for people generally (although I am sure that the coach/tourist companies will think it is great! ); the Bridge is a major route into the city for many people (both commuters and recreationally, and on bicycles as well as in cars), and I would ask the council to reconsider their proposals. 1. I note the proposal to build "speed table / informal pedestrian crossings" at two points before the Bridge. In this case, surely the raised central reservation (which is itself an "informal pedestrian crossing") is unnecessary and should be removed? As a cyclist passing through this area, I find too many motor vehicles become frustrated at being unable to safely pass me because of the narrowing of the road created by the central reservation, and drive dangerously. If the reservation was removed, then the carriageway would be wide enough to either widen the (absolutely pointlessly narrow) cycle lane marked on the lane approaching the Bridge so it is fit for purpose, or to add another pointlessly narrow one on the carriageway leaving the Bridge. 2. 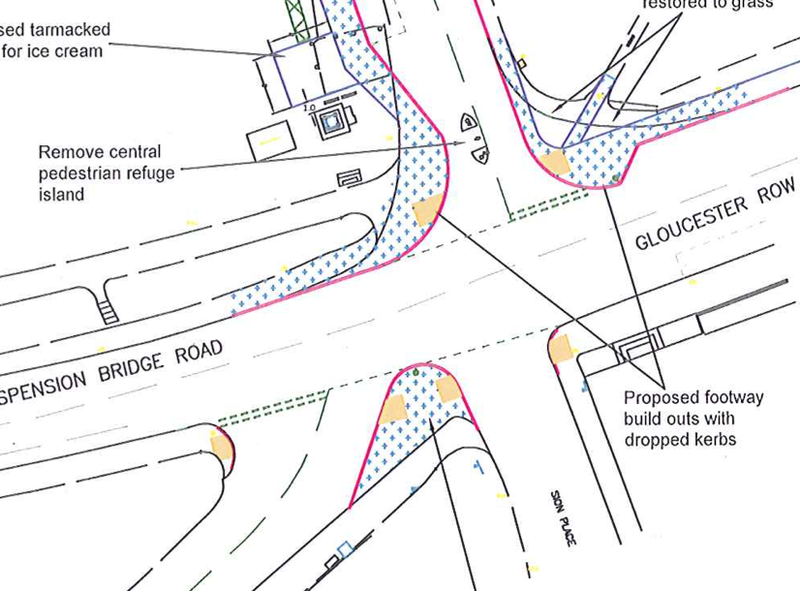 I note the proposal to "build out" the footway at the junction with Observatory Road. Again, writing as a cyclist, I am very concerned that this will force bicycles out toward the right of the carriageway just at the point where motorists behind them are accelerating to get past them before the zebra crossing further along by the Mall. Finally, I am not sure that encouraging coaches to drive as close to the Bridge as they can before disgorging their parties of tourists, then picking them up again and driving to the next beauty spot is a particularly environmentally friendly aim, given Bristol's recent win as European Green City. The Gromits are across the city, and finally we have reason to visit the otherwise boring parts of the city -here, Clifton. And here is how to get there from Hotwells. The audio commentary is too low to be understood, but that's OK, it's not very interesting. It is reminscing about pre-gentrification Hotwells, when you needed to know the football results to fend off queries in the (now Bath Ales) pub, when the sole cash machine was in a massage parlour, and the post-office used to sell draught scrumpy if you brought in your own container. Sadly, that policy has not been rolled out to other POs in the country. It's long as the tax-dodger over-meanders around nearing the Lion Pub (recommended) at least three times, Church Lane and Constitution Hill upper (4:11+) being the hardest part. Ambra Vale (0:48) is going to be interesting, as it will go RPZ. Here, on a weekday, you see paveparking and narrow roads, but nothing worse than Montpelier. The difference is that Cliftonwood gets commuter traffic heading to the city or Clifton, where you can come in off the A4 portway or A370, find a space and then walk to work. This video will be the "before"
meanwhile, there are lots more Gromits to visit. The whiteladies road uphill path, the one covered over by a build-out for a new pedestrian crossing is not apparently, dead, merely sleeping. Instead some paint will go on the road showing cyclists where to go to end up under a bus. This is called "London-style infrastructure". Adam Semy sends us a "before" link. Adam thinks that in the video LS07CFM is beeping at the cyclists. We're not sure -they could be beeping at the BMW that was forced to swing out so as to get past the cyclist heading uphill. This shows how the addition of build-outs actually makes things worse for drivers: we get held up by bicycles, or have to perform dangerous manoeuvres. Same for pinch points: the fact that they create car/cyclist conflict is as inconvenient for drivers as it is dangerous for cyclists. Apparently the build-out is so that queueing parents with children and push chairs can wait safely for the lights to change. This shows something important: it's not a zebra crossing, where they wouldn't have to wait, but a pelican crossing where they do. Presumably BCC and FirstBus didn't want a road and a showcase bus route to be help up by school parents -and if more people were walking to the new school, that is exactly what happened. This is why FirstBus also wanted the zebra crossing from the downs to Blackboy Hill removed -a want that got denied on the basis that "the students would cross anyway". It's interesting to consider if a new zebra crossing lower down would delay traffic -because on a weekday morning it's a line of cars anyway. The fear of traffic flow impact is enough for a zebra crossing to be omitted, and for a cycle time on the lights long enough that even at school run times parents will have to wait. This is important: anything that hindered motor traffic flow at school run times would penalise school-running parents! As for the cyclists, well, nobody will miss them. It's not as if they can ask for the money spent in the name of "cycling city" back. They'll see that when BRT2 goes over Prince Street Bridge. What it does show is this: Clifton is the heart of the Bikelash -the part of the city fighting back against bicycles, one TRO at a time. This is the last day to get some feedback in to the Suspension Bridge Proposal, -the council page has the details. The BBC also covers it, saying the plans will make it "more pedestrian and environmentally-friendly "
We fail to see at all how this makes it more environmentally friendly at all. It tries to slow us down, but as we can go up to 30 mph once the speed bump is cleared, that doesn't save any fuel or CO2. It doesn't encourage cycling to the bridge, because it doesn't encourage cycling. And yes, it may be "pedestrian friendly", but as the pedestrians they have in mind are walking round from the coach parking bay, that's not very environmentally friendly. Are we going to write in opposing this measure? We are unsure. Given all it does is add a speed bump and a pinch point, it doesn't make that much difference: another 10 seconds of sitting 50cm behind a cycling family nervously worrying about our revving engine -and we'd do that for fun anyway. The tax dodgers, now they may want to say "there is nothing environmentally friendly about a proposal that makes it even more hazardous and bicycle unfriendly"
This is why we are not at all surprised to read this objection. We're a bit worried about their grand vision of making the Suspension Bridge a cycling gateway to the city. We don't want more cyclists and making all the bridges dangerous can do that -the "London Style Cycle Route" plan. Fortunately, we are confident that the traffic planners handling the Clifton area see eye-to-eye with us, what with the new Pinch Points on Whiteladies road and the Triangle, and the (currently on hold) proposal to add parking to Clifton to make it worse to cycle. I am writing to object to the current plans for the bridge on the basis that not only does if fail to identify and address the current cycling hazards, the addition of a pinch point will make it worse, I propose instead a cross-bridge plan to make the bridge a safe and more popular cycle route, and so enable the city to achieve its cycling goals. The proposal will actually make exiting the bridge on a bicycle even more dangerous than it is today, especially for families and young cyclists. 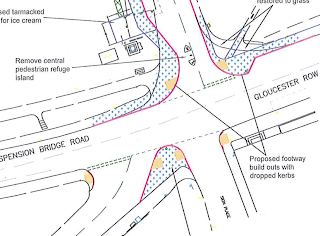 The bridge exit and entrance plans need to be urgently reviewed by stakeholders in safer cycling: the council cycling officers, the cycling campaign, the cycling team in the N. Somerset council. There is a opportunity here to begin to implement a coherent design for a safe cycle route over the bridge, spanning the Abbots Leigh side, the bridge itself and the Clifton side. As it stands the proposal appears to be using myself and my son as a traffic calming measure in the name of pedestrian safety. I cycle over the bridge three times a week on my own, addressing the risks by cycling fast and taking the lane, despite the frustration that builds up in the vehicles behind. I also cycle with my family, including my 11 year old son. It is he that I'm worried about. The approach has a a bike lane painted on it that is too narrow to be safe, runs into the parked cars at the bridge, and effective vanishes at the pinch point created by the central barrier. All it does is create unrealistic expectations in drivers that the cycles are not to be in their way. The drop off to the road from the toll bypass is not in a good position. In fact, the new toll booths "to improve traffic flow" make it worse when cycling, is there is now a shorter interval between cars. When an adult is trying to get a child out as well as themselves, this change is noticeable. The bridge crossing itself is usually relatively calm, though you invariably end up with a car driving behind you, waiting to get past. Sometimes they do this on the bridge, which, with the oncoming traffic means that they tend to cut in as soon as they can. Thankfully, this is rare. It is the exits that are most problematic. After being held up by cyclists -in the case if a family group, slow moving cyclists, by the end of the crossing the impatient drivers invariably want to get past them. Because the central reservation prevents them front doing so safely, yet the slightly wider road invites the possibility. Here there is a tangible risk of a collision with a car trying to squeeze past. On my own, I can stay at 15-20 mph, stay far enough out in the lane to block the cars. I continue like this until the reservation goes away. At this point I can move to the left, where there currently is enough space to go, and let the cars past. With a family, getting on the bridge is harder, crossing it mildly worrying, but it is that exit that I fear. With a family you've taken longer to get across, the number of vehicles behind will be higher, and the other family members lack the speed and aggression to "take the lane". It's is where we are most at risk. If there was somewhere to pull over, I'd be tempted to get my family to do so -but instead we have echelon parking bays where vehicles reversing out become yet another hazard. Once past the area with the central reservation, it becomes safe to cycle again, as we can keep to the side and let the cars that have been held up past. It is at this point where cars can pass safely that a pinch point -the build out- is proposed. The area where my family and I can cycle leisurely while cars go past is to be replaced with a road where I will need to aggressively pull out and block the cars so that my family can safely cycle. Any cyclist without fitness and aggression will be in trouble. The build out/pinch-point represents a significant new danger to cyclists -it is critical that this is dropped. It endangers cyclists while failing to provide a significant improvement in pedestrian safety. The raised areas are likely to be slippery in the wet or ice. Whatever material is used it must be a high friction surface. The failure to recognise and address the exit-side cycle safety issues: the central reservation and the echelon parking -mean that the existing features will remain hazardous. The failure to identify and address the hazards on the approach: the unusable cycle lane, the pinch point created as the central reservation appears, and the now shorter safe period to exit the tool booth bypass means that it is just as hazardous as ever. The coach parking will remove part of Clifton Down. Dedicated coach parking cold be provided further round the corner- this would also handle the situation where more than one coach visits. The space for such parking will be made available once Clifton becomes an RPZ. Overall then, it is a disappointing design that implies that the needs of cyclists have been completely neglected - more effort has been put in to provide coach parking than a safe and pleasant cycle experience. Here then, is a counter proposal. Rather than ignore the needs of cyclists, recognise that the bridge is a key commuter and leisure route for cycling -and could easily be made a key destination for visitors to the city who come by bicycle. The parking areas on the bridge exits to are removed. On the Somerset side a segregated cycle path can be implemented -it must be segregated to prevent it being downgraded to parking. On the Clifton side, I propose providing cycle parking and a permanent bay for the ice cream van, which will no longer need to occupy the cycling approach to the bridge. The pavement on the Clifton approach should be widened, the bushes cut back, and a cycle lane installed on it -by raising the currently allocated on-road cycle lane. The Abbots Leigh approach should have a gradual reduction in speed limits starting before the bridge itself is reached. I believe there is also room of a segregated cycle path on this approach. A means is provided for cycles to go on the left side rather than the right side of the gatehouse. It's was of course a requirement when bicycles had to pay the toll, so is demonstrably possible. A cycle traffic sensor is installed in the toll booth bypasses, a sensor which keeps the barriers down when bicycles are passing through. It's I'd entirely consistent with the councils's hierarchy of provision model. This. Sensor could also collect cycle traffic statistics. The bridge speed is lowered to 15 mph. It was 20 mph until the mid 1990s, to no ill effect. Reducing e speed would remove unrealistic expectations from car drivers as to how fast they can safely driver over the bridge. The actual road at both ends is converted into a shared space are where pedestrians have priority. This should eliminate the need for a central reservation, the build out and the speed bumps. The surface must still be high friction in the wet. Vistors to Bristol and clifton are encouraged to explore the city and environs by bicycle, with signing to link up the Railway Path, the proposed Avon Promenade, Festival Way and the suspension bridge, as well as more signage from Templemeads and Clifton Down stations. This may seem an ambitious plan, but it is necessary. the bridge is a key cycle roué in and out the city, popular with commuters, leisure cyclists, be they road or MTB, and families. West of Templemeads it is one is one of the sole two crossings that are relatively safe and pleasant to cycle., of the The other, by Hotwells, has the BRT2 route planned for it, and while it will remain open to bicycles, the BRT building will take it out of action for some time -diverting more cyclists to the bridge. The growth in cycling and diverted traffic means that making the bridge safer to cycle over is essential -especially now that the Long-Ashton extension of Festival Way is designed to bring in more cycling traffic. The bridge can form a a key access point to a city with ambitious cycling goals -an access point which my proposal offers. The overall plan may take time to be implemented, but individual parts of the grander proposal can be -of which the Clifton side, the gateway to the city, must be a core part. If the council is unwilling to draw up ambitious plans to upgrade key cycle access points to make the safer and sustain a higher load, then the city's overall plans to increase the percentage of cycle traffic is doomed. This bridge proposal, then, represents a test of where the city really wants to go. Suspension Bridge Video -and some cyclists dare to complain? This is a saturday and traffic is quiet, apart from Mercedes GY62KKT trying to turn over the cyclist at 0:10, not much happens. 0:25: the normal ice-cream van in the bike path has been replaced by an ice-cream bicycle on the pavement. Shocking. 0:30: some pedestrians walk across the bridge. They should recognise that drivers have paid to be there and not walk around. This is why they are not allowed to cross in the centre of the bridge area. 0:40-1:06. Toll dodger cycles over the bridge. There are three oncoming cyclists, showing that nobody is paying for its upkeep. It also shows that there is pent-up-suppression needed for this crossing, which we are grateful for Bristol Council to provide. 1:14-1:3. Toll dodger exits the bridge, but the central barrier again stops anyone important trying to get past -no matter how much of a hurry they are in. There isn't quite enough room unless they pull over into the echelon-parking bays. We really need signs saying "cyclists pull over to let paying users past"
That's it then: the bridge on a summer saturday from a tax dodger's perspective. They ignore the cycle lanes that we paid for from road tax, yet choose to use the toll booth bypass when they want to. Then they pootle across potentially holding up traffic -not just on the bridge, but at the exit. The consultation isn't going to do anything to address these hold ups -the barriers will remain in place. there will be some speed-pavements on the approach (0:20-ish), but you need to slow for the queue means that has no impact. Hopefully they will be made of slippery bricks that will drop roadies out for a wiggins-worship weekender. Clifton is the home of Bristol's bikelash, so we are glad to announce another council proposal to make cycling there less pleasant. This is a particularly good new feature as it is designed to impact even passing-through and leisure cyclists. By placing it at the entrance to the city, cyclists will immediately know that this city does not welcome them. The proposals are for some traffic calming measures at the Clifton side of the Suspension Bridge. Here is what the approach looks like today. A wide road with some paint in the gutter to remind cyclists to get out of the way. A central reservation appears, just at the corner where even cars are forced into the gutter. The risk of hitting a cyclist here is so high we think they should be banned -if not formally, then informally, the way they are at the Bedminster and Templemeads bridges/roundabouts. The road here widens. but not quite enough to get past those cyclists who are not following the niceway code -and are instead holding us up. You have to wait until the central barrier goes before you can speed up and get past them. Yet it is up ahead here, at the approaching left turn, that a build out will be added. This will mean that not-nice cyclists will stay in the middle of the lane, while even nicewaycode cyclists who stay in the gutter will suddenly swing out. This gives us mixed feelings. Pro: it makes it worse for cycling. Con: those few who do cycle will inconvenience us more. Have a look at the plans -and write in to the Council by Aug 5 to let them know whether you approve or not!